Frustrated by all of the manual effort and time you're spending developing complex system-level coverage-driven tests to verify your system on a chip (SoC)? 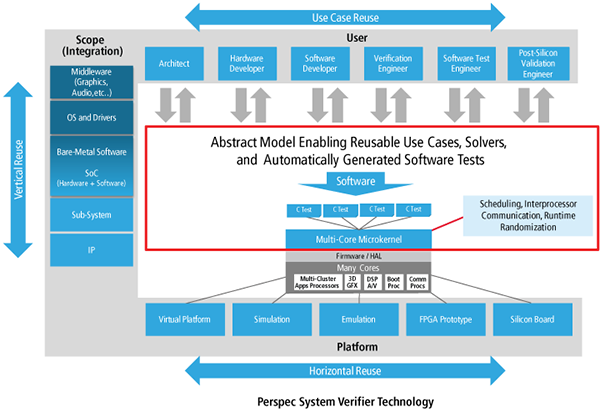 Cadence® Perspec™ System Verifier automates this entire process, reducing complex use-case scenario development from weeks to just days. Compared to manual test development, you'll be able to generate 10X more tests using this platform. In addition, with its integrated debugging capability, you'll be equipped to reproduce, find, and fix complex SoC-level bugs in order to improve the overall quality of your SoC. Using Perspec System Verifier, you ll benefit from completeness of measurement, with coverage of functionality, flows, and dependencies. You ll also gain knowledge transfer advantages, since the formal, model-based system description supports knowledge sharing between different groups, particularly hardware and software engineers.